She tied a young man’s heart within. 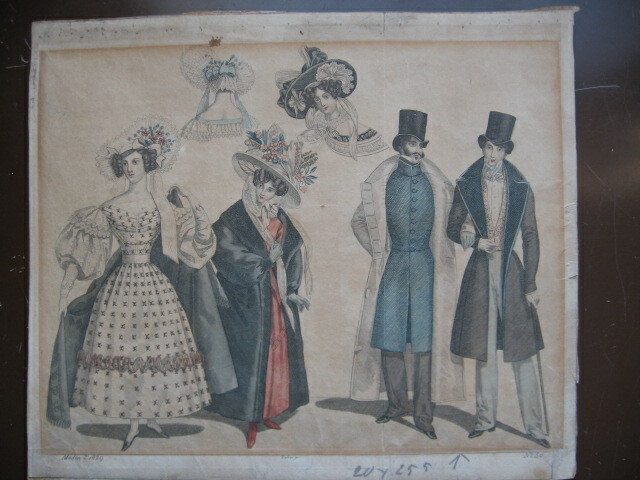 German fashion plate - "Moden Z. 1829 - Lohse sc(?) - No. 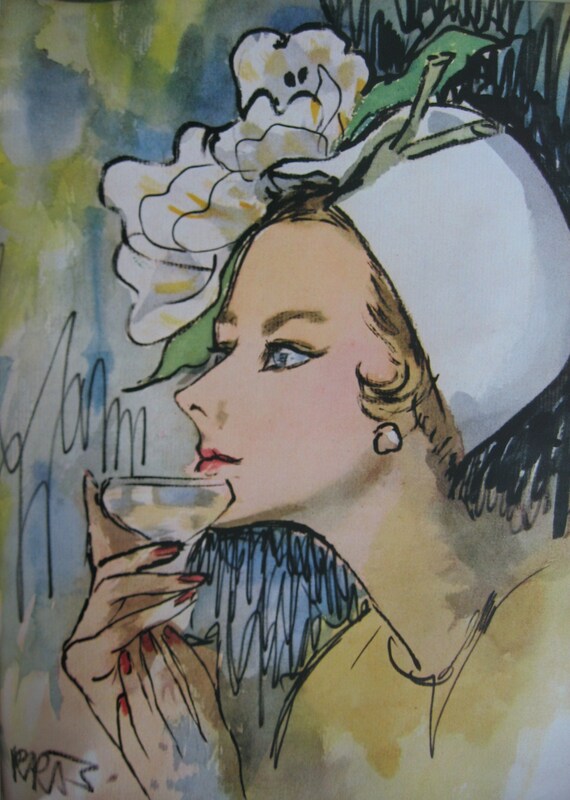 50"
Throughout history hats have held an important place in the world of fashion. Whether the year was 1829 with the pretty - and enormous! 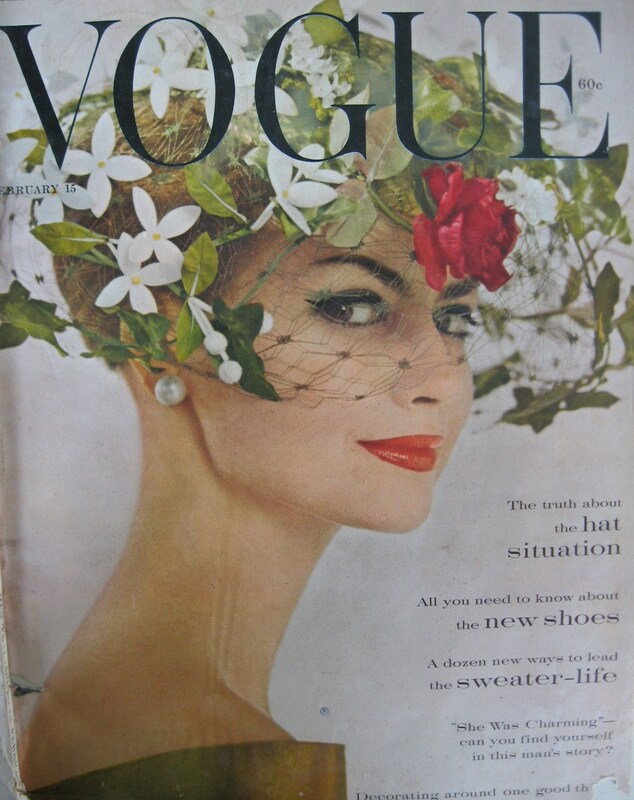 - German bonnets (above)...or 1960 with a fresh floral spring hat on the cover of Vogue (below). 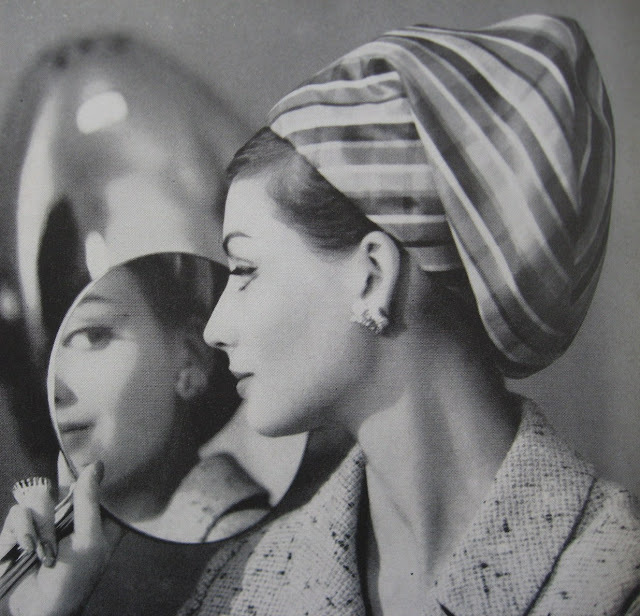 Vogue, Feb. 15, 1960. On the cover: "First glimpse of the hat situation - through a little-evening cage of green leaves, white stephanotis, and a rose-coloured rose at brow-level. 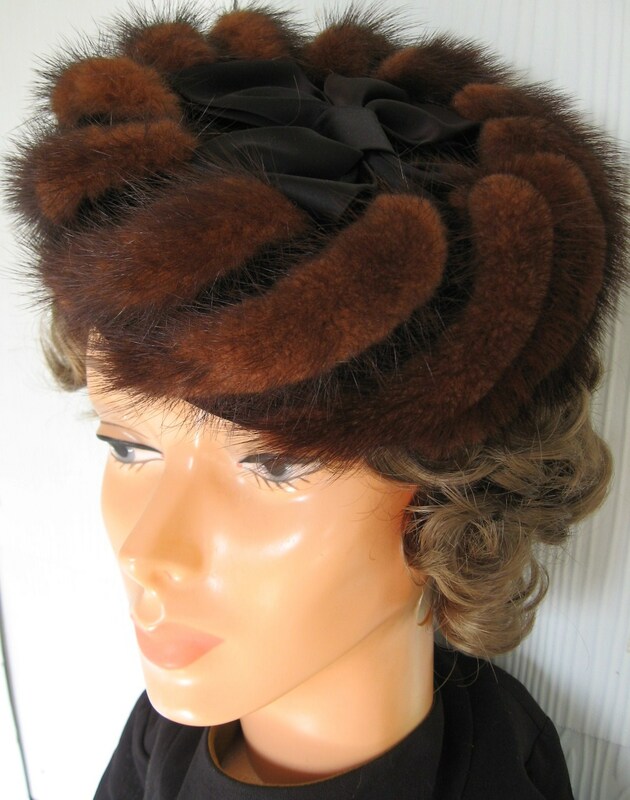 All-out deliciousness is one of the self-evident truths of the hat situation this spring." The truth about hats is: like diamonds, they're not among the necessities of life, but are among the tonic pleasures, and they add a tremendous charge of dazzle. 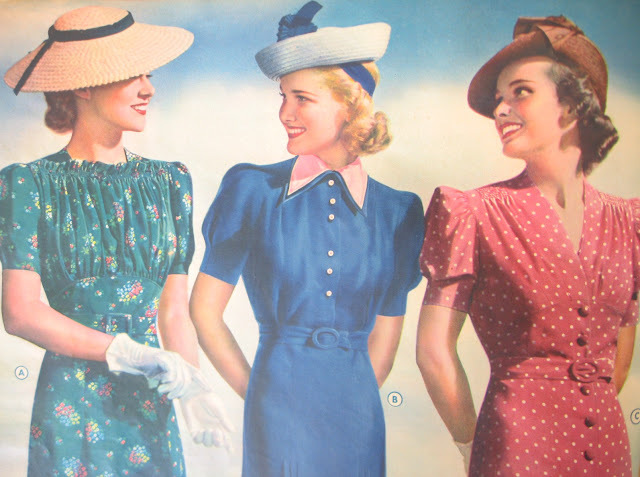 In another generation, we heard "you're not dressed if you don't wear a hat," but the obvious truth is that many smart women are now beautifully, though hatlessly, dressed, wearing marvellous hair as a substitute. 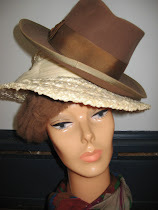 What we are getting at is this: hats are golden chances for a chic woman to acquire extra chic. 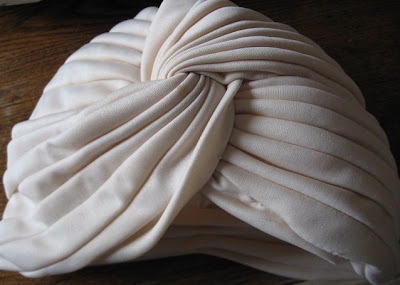 This year, designers are coming up with a special surge of hat excitement - spectacular bulky shapes, or tiny toy hats, in featherweight substances of straw, organdie, silk, with results ravishing enough to tempt even the most diehard of the no-hat cult. 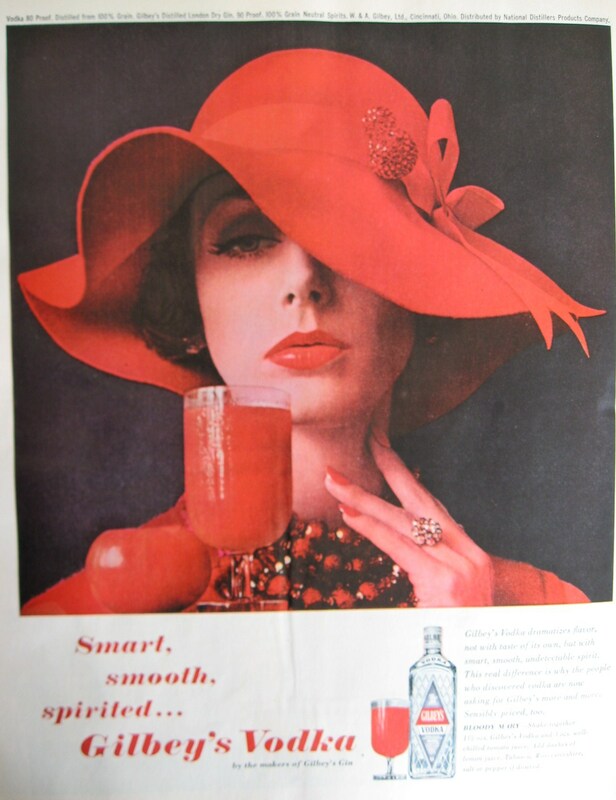 About no-hattism: we have often found this to be simply the fact that, as the lovelorn columns say, the right one hasn't come along (this, a corollary of the principle that you can't marry a millionaire unless you first meet one). 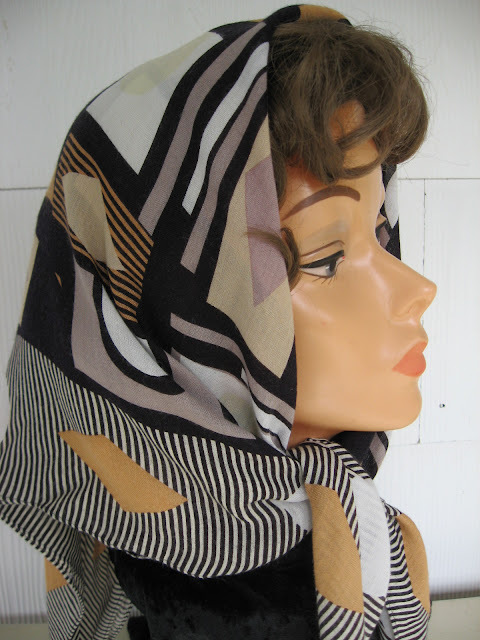 Our advice to the hatlorn is to keep trying; each fresh batch of hats holds fresh chances to look wonderful..."
Taffeta striped beret - a fresh edition of the paperbag beret in brilliant Roman striped silk - purple, orange, beige. 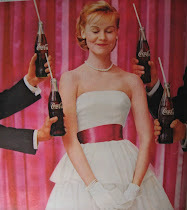 Vogue magazine, 2/15/60. Fez fare...in felt, with a new head-on approach to flowers - a spray of tulips stemming from box pleats at the front. 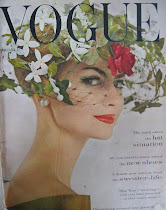 Vogue magazine, 2/15/60. Spring...and a New Hat for Audrey Hepburn. 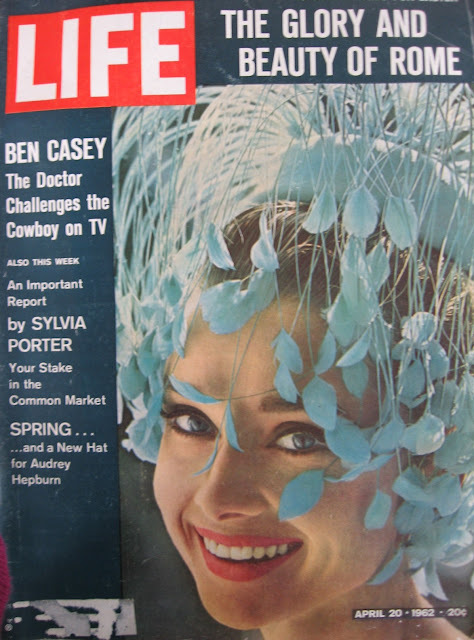 Life magazine, 4/20/62. 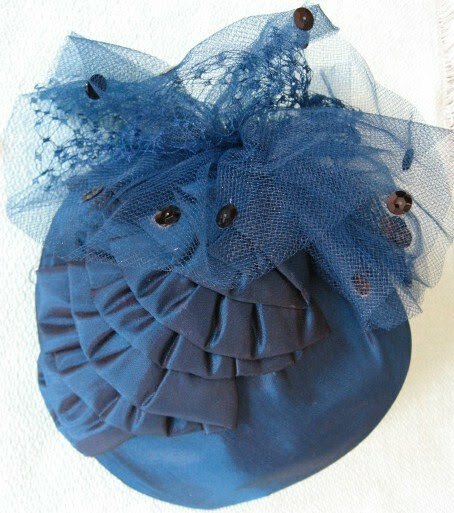 ....and below is a stunning peacock blue hat with rows of pretty pleats and a tuft of netting and sequins on top! 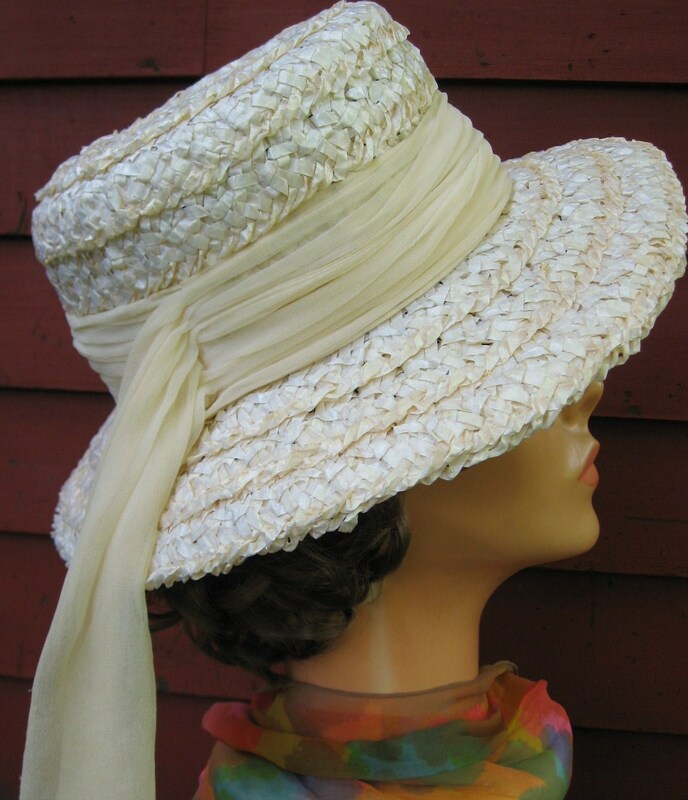 The soft yellow straw hat above is wrapped in a pretty ribbon, and has a Dayton's label inside. Dayton's department store was a favorite Mpls./St. Paul fashion destination for years. I'm always happy to find vintage clothing with one of their labels because it brings back good memories of shopping excursions there when I was younger. But here's my favorite of all. Found just yesterday! Truly a work of art. Don't you agree? Hi! 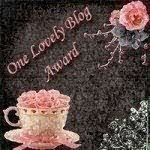 Thanks for visiting my blog a while ago. Usually I pay back a visit sooner but somehow the summer, my daughters' graduation party or whatever got me stuck, but here I am, ready to enjoy your blog. It looks great, I love those hats! Too bad that you are easily overdressed wearing a hat nowadays, unless you're a member of the most severe protestant church over here. I can see the ladies go to church wearing their hats (sometimes in a bag in their hand) every Sunday. 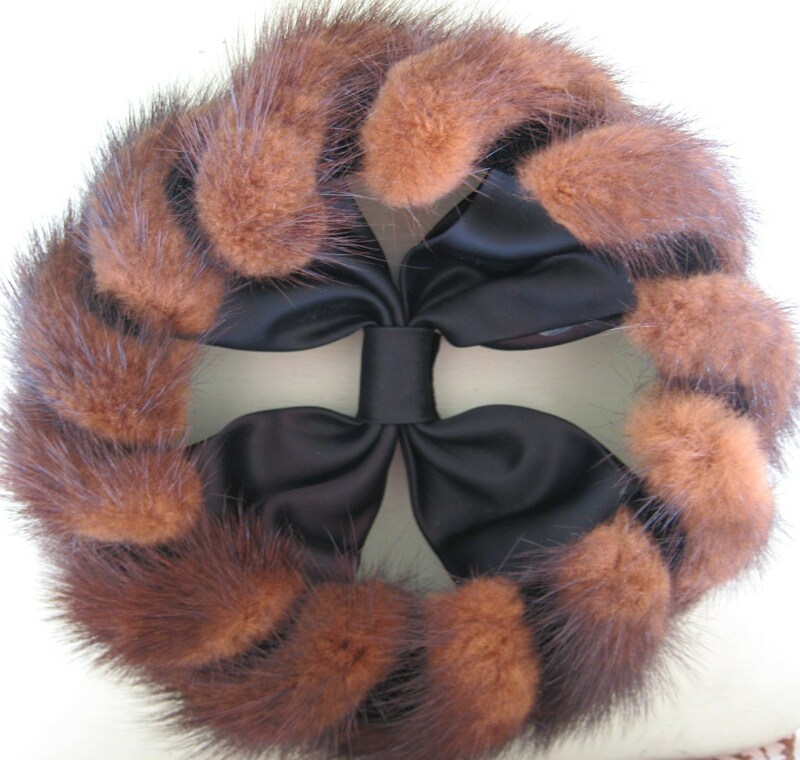 I bought a fake fur hat a couple of years ago, but I never wear it, because I instantly feel like our Queen Beatrix (google her) when wearing it. 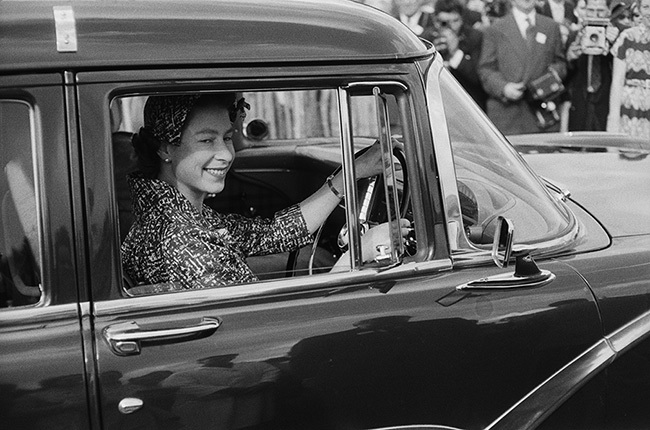 I wish more women were brave enough to wear hats - like your Queen Beatrix. 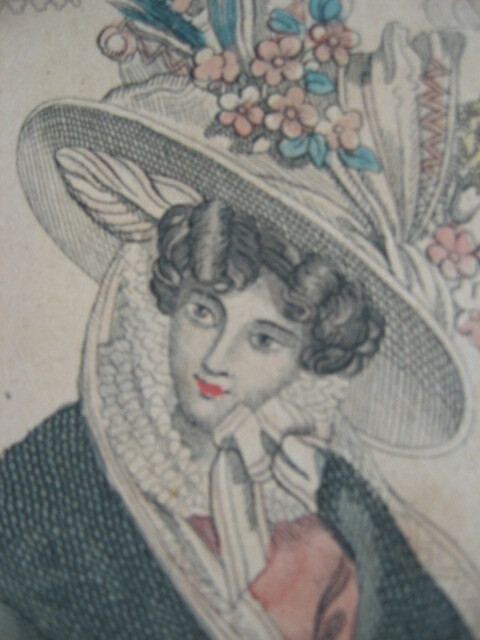 I think her hats are great fun! This past Mother's Day I went shopping with my sisters, and they convinced me to buy the hat that I'm wearing in my "About Me" photo. I wore it in the Mall for a little while, but I felt so self-conscious even though I knew that the hat looked good on me. Be still my heart! Could it be???! A vintage hat blog! That I stumbled upon by accident? 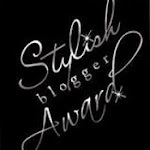 I've been blogging and reading blogs for 7 months... Trying to find one. I ADORE hats! 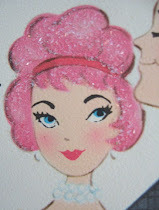 I saw your picture from your "following" icon on someone's blog... And man, your hat just grabbed me! 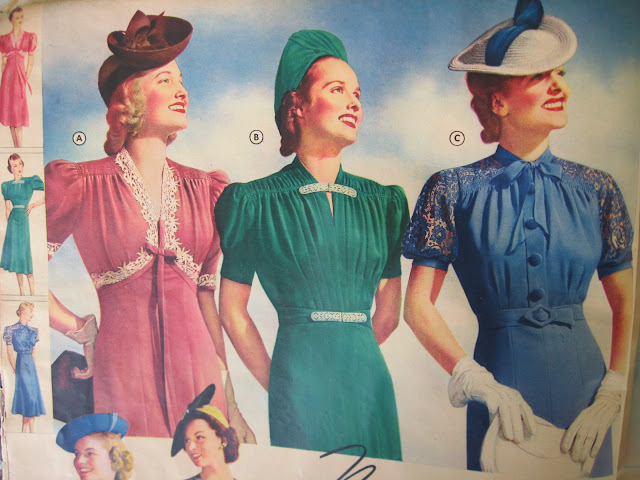 These are all perfect hats and I love the wide variety of styles from an even wider variety of time periods ... It's a shame they aren't popular or sold widely. You should make it a trend! 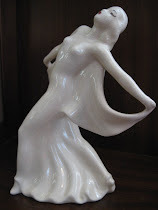 Thrift shops and one-of-a-kind shops seem to be the way to go. Thanks so much for this. I mean it. I'm so excited for your next entry. I'm glad you stumbled across my blog. I'm new at blogging, so I'm thrilled when anyone stops by for a visit! 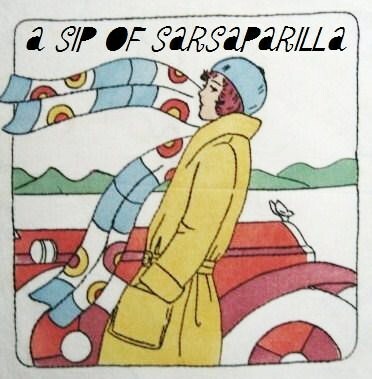 Send me an email - sarsaparilla.antiques@yahoo.com - and I'll be happy to send your way any hat blogs that I find that I think you might enjoy. 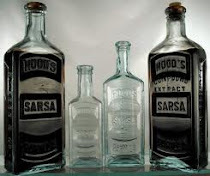 For a wonderful historical view you might want to visit "Many Hatty Returns" at http://www.manyhattyreturns.com/. Thanks! I'm so going to email you. I've decided you are cool. I will check that website out too. Oh, and I totally understand the excitement when someone stops by, especially when the person find you, not you finding them. It's a lovely surprise! You may be new at this, but it sure doesn't seem like it! Only 13 Muscles Are Used To Smile!